Herbs, shrubs, small trees, or climbers. Stems sometimes prickly, rarely thorny; hairs simple, branched, or stellate, sometimes glandular. Leaves alternate, solitary or paired, simple or pinnately compound, without stipules; leaf blade entire, dentate, lobed, or divided. Inflorescences terminal, overtopped by continuing axes, appearing axillary, extra-axillary, or leaf opposed, often apparently umbellate, racemose, paniculate, clustered, or solitary flowers, rarely true cymes, sometimes bracteate. Flowers mostly bisexual, usually regular, 5-merous, rarely 4- or 6-9-merous. Calyx mostly lobed. Petals united. Stamens as many as corolla lobes and alternate with them, inserted within corolla, all alike or 1 or more reduced; anthers dehiscing longitudinally or by apical pores. Ovary 2-5-locular; placentation mostly axile; ovules usually numerous. Style 1. Fruiting calyx often becoming enlarged, mostly persistent. Fruit a berry or capsule. Seeds with copious endosperm; embryo mostly curved. About 95 genera with 2300 species: best represented in western tropical America, widespread in temperate and tropical regions; 20 genera (ten introduced) and 101 species in China. 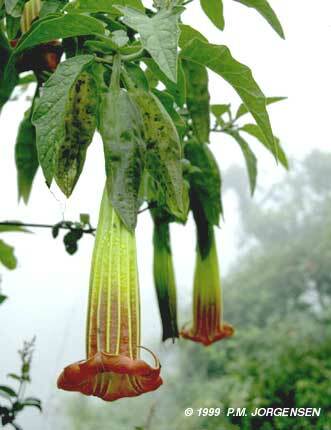 Some species of Solanaceae are known in China only by plants cultivated in ornamental or specialty gardens: Atropa belladonna Linnaeus, Cyphomandra betacea (Cavanilles) Sendtner, Brugmansia suaveolens (Willdenow) Berchtold & Presl, Nicotiana alata Link & Otto, and Solanum jasminoides Paxton. Kuang Ko-zen & Lu An-ming, eds. 1978. Solanaceae. Fl. Reipubl. Popularis Sin. 67(1): 1-175.